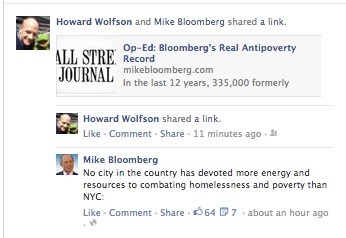 Mayor Bloomberg touts his Wall Street Journal op-ed page defense of his anti-poverty record in the face of the New York Times Dasani series by posting, to Facebook, the claim that "No city in the country has devoted more energy and resources to combating homelessness and poverty than NYC." You'd hope that a mayor as smart and as empirically minded as Mr. Bloomberg, however, would realize that the measure of achievement on this front isn't how much "energy and resources" you devote, but what you get for them. Otherwise it's all just a waste of time and money, or energy and resources. What counts isn't the input, but the output. If the city could help the poor more by spending less energy and resources, that would be better. What matters isn't how much money you spend, but the results. I don't know that bragging about how much the city spends fighting poverty really addresses the issue raised by the Times series, which is that the living conditions of Dasani, her seven siblings, and her parents are miserably poor. It reminds me of a post from earlier this year by Dalibor Rohac about the error of judging policies by their intentions rather than by their outcomes. Maybe the Times or Bill de Blasio are questioning Mayor Bloomberg's intentions. But the really devastating critique of Mr. Bloomberg and of the entire anti-poverty industry isn't a critique based on intentions, but on outcomes.